I have been trying to post some of what I've been doing at story times recently, but between daily life, dealing with the recent passing of my father-in-law, and various things at work, just never have managed to finish most of my posts. 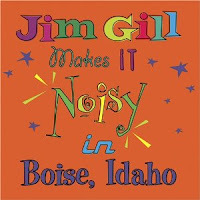 I started a New Year of programs with a program about the months, and when I do that program I always include this book. It's out of print and I just bought a used copy in excellent condition to make sure I always have it. This is my sort of book for a story time--the sort that holds lots of opportunity to get the kids physically involved with the story. 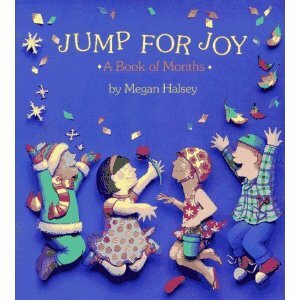 We "Jump for joy in January" and then go on to such things as making pretend mudpies in May, juggling pretend jacks in June and doing a dance in December. This year when it was July: "Join A Jubilee" we marched and I sang "Yankee Doodle"-with my oldest kids it really became quite a parade. And when it was "Admire an artist in August" we discussed what we'd like to draw at the beach. Even though I can't draw, I CAN pretend! Where have you been all these years, Jim Gill? I happened to hear some clips of your music on a video about baby programs, fell in love with your music and got this album. We did his "List of Dances" song, which offers directions (and then you do them all again in reverse order!) and "Let's Dance Now" for some free dancing, something that I am a big, big advocate of everyone doing with their kids--and no whining about how you have 2 left feet. I do and I go to ballet class twice a week anyway! My Chinese New Year/Year of the Dragon was a bit of a bust. The stories were fine--got lots of Chinese tales to do--but I wanted to do a dragon dance and let the kids bang on musical instruments and make noise. This didn't work too well, partly because of the passivity of the families and partly because I just couldn't find THE perfect music! I can't say if this would have gone over better for my 3 and up set (probably would), because the death of my father-in-law put an end to my being at work that week. Hopefully next year I can try something similar and even more hopefully, next January will be a lot better! And February's been a pretty good program month. Some new ways to do some favorite things of mine coming up in the next post!